I decided to do some benchmark cycle performance testing on my indoor trainer. My trainer will display (on the computer) your heart rate, speed, cadence, and power. 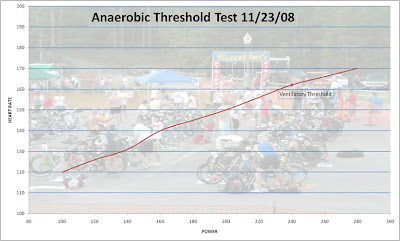 Using these parameters and the instruction from Joe Friel’s The Cyclist’s Training Bible I set out to conduct the test. I warmed up for 2 miles (about 6 minutes) on the trainer. I loaded a 10 mile course with 0 slope. The test instructs you to start at 100 watts and increase your power output by 20 watts every minute. At each minute you record your power, speed, heart rate and perceived exertion (scale from 6 – 20 - very very easy to very very hard). I wish that the results were a little better but it gives me a baseline to improve upon. I will retest this approximately monthly to determine if my cycle training is improving.